Oracle has chosen not to name its artificial intelligence efforts after a genius departed, like Einstein, Leonardo, Watson, or Coleman. This does not mean it has refrained from baking AI, especially machine learning, into its database and applications. Far from it. Larry Ellison, the company’s founder and chief technology officer, declared the Oracle database “autonomous” – and revolutionary – last year and co-CEO Mark Hurd has been stressing the machine learning being added to the vendor’s applications since then, too. Allied to the turn to autonomisation has been the firm’s march to the cloud, which has been steady and, despite financial analyst concerns that the revenue from it has been obscured, ostensibly serious in intent. 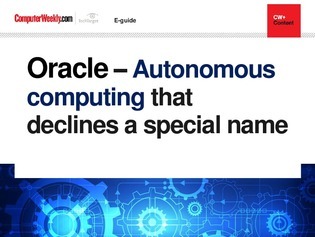 From this e-guide you can follow Oracle’s twin paths to adding AI and delivering its software over the cloud – on its own platform and infrastructure as a service, from 2017 to 2018. An over-arching theme of Oracle’s case regarding its infusion of machine learning and its declared re-architecting of its cloud delivery has been security, security, security.